Widely adaptable. All but very wet or droughty soils. Mixed borders, cut flowers. A good butterfly, bee, and bird plant. Easy. I chose this over the 'Goldstrum' strain because it seems to have fewer foliar disease problems. 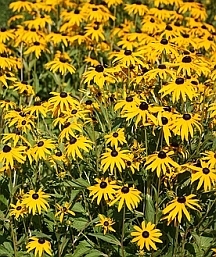 A classic Black Eyed Susan flower. Very long lived.